Flipkart has just announced its Flipkart Apple Week where the company is offering discounts on a number of Apple products. The products range from anywhere between the older iPhone 6 and MacBook Air to the latest iPhone X. There are a lot of deals here which will satisfy the needs of most of the people who are looking to buy a new Apple product. 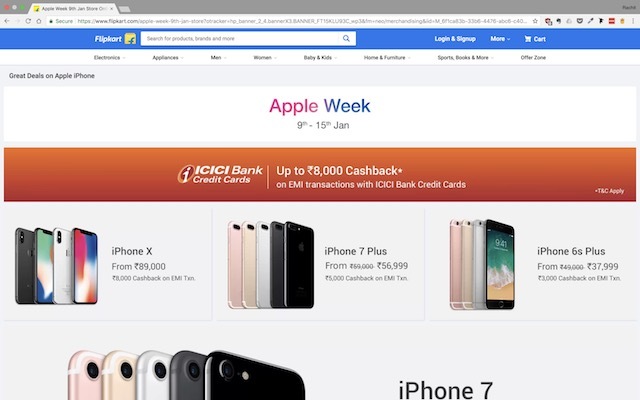 Sadly, Flipkart is running this Apple Week in partnership with ICICI Bank so only ICICI bank credit card holders will be able to take benefit of these deals. There are a lot of terms and conditions to go through and we are going to go through all of them, but first, let us take a look at all the deals which Flipkart is offering us. As you can see, all the deals under the Flipkart Apple Week are in the form of cashbacks which you will receive once your purchase has been verified. The cashbacks vary from Rs 2,500 to Rs 8,000. The list above shows you how much cashback you are eligible for on each device and how much is the minimum amount you need to pay using your ICICI bank credit card to avail the cashback. For example, if you want to avail the INR 8,000 cashback while buying the iPhone X, you will at least need to spend Rs. 74,000 on your credit card to avail that offer. 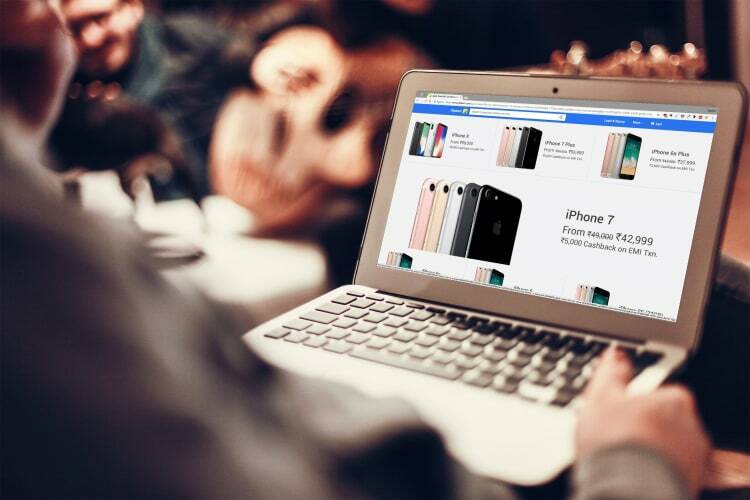 The Flipkart Apple Week offers include deals for iPhone X, 2016 models iPhone 7 and iPhone 7 Plus as well as the older iPhone 6S, iPhone 6S Plus, iPhone 6 units, plus the cheaper iPhone SE. In addition the latest generation iPhone 8 and iPhone 8 Plus are also included in this offer. Among Apple’s other products, there’s a Rs 8,000 cashback offer on the Macbook, as well as deals for the 9.7-inch iPad, and the larger iPad Pro. Finally, all three generations of the Apple Watch are also part of this special offer week. The offer is only valid from 09th January 2018 (00:00 Hours) to 15th January 2018 (23:59 Hours). Not all ICICI cards are eligible for these cashbacks. The Offer is only applicable on EMI transactions on ICICI Bank retail Credit Cards. The cards which are not supported are ICICI Bank EMI Card, Corporate Card, Business Card and ICICI Bank-American Express card. A user can avail only a single offer per credit card. Cashback will be credited latest by 15th April 2018. The Offer is only applicable in India and transactions are done in INR currency. So, if a user satisfies all the above-mentioned criteria, he or she can avail the offer. Also, since ICICI is not offering no-cost EMI, you will have to select the smallest EMI Plan (which is 3 months) to actually receive any benefit. For example, on iPhone X, if you take 3 EMIs, you are essentially paying around INR 1,900 in interest. That basically means that you are only getting a discount of INR 6,000 on your purchase and not 8,000 as mentioned in the offer. Yes, the offers are a little bit deceptive but if you are a little careful about how you make the purchase, you can actually get some pretty good discounts here.